Friday morning we drove to Warhammer World for a Grand Tournament warm up day. James and I stopped off for a McDonald's breakfast on the way, while Luke would meet us there later. We arrived quite early, so with no one to challenge, we played each other. Perhaps my recent break from playing 40K on a weekly basis has really helped, because it was during this game that I developed some new tactics which would go on the serve me well at the Grand Tournament. I went on to not only contest objectives, but capture them as well! But more on that later. 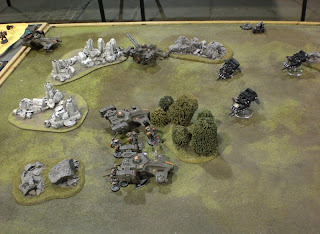 Having played my Tau army many times, James had a good idea of how to beat me. He also knew that driving his very fast, hard hitting and incredibly tough to kill army straight down my throat was the surest way to secure victory. So that's what he did! James won the roll off, placing his objective to the right, while I placed mine to the left. He placed Sammael in the centre of the board with a bike squad either side. The Land Speeders would arrive on Turn 1, while the 3 attack bikes and another bike squad were held in reserve. He used his scout move to move the two bike squads 12" forward. I wanted to mess his day up by seizing the initiative, but failed the roll. In his first turn, his 3 Land Speeders turbo boosted down the left flank towards my objective. Sammael held position in the middle while the two bike squads turbo boosted to my board edge and spread out along it. While the tactic had worked against Luke's foot slogging Tau, my mechanised army of skimmers and jet pack Tau Battlesuits could simply fly over the line of bikes...apart from the Broadsides who walked on to the objective on the left, meanwhile the rest of the Tau army arrived on the right, intent on capturing James' objective. He certainly didn't see that coming! Firewarriors piled out of Devilfish as the entire Tau army opened fire on the two bike squads, wiping out one squad and reducing the other to 3 men. James Charged two of the Firewarrior teams with the 3 remaining bikes, killed one of the twin linked flamer Battlesuits with Sammael's assault cannon while his bike squad in reserve arrived from the right flank along with 1 attack bike. The attack bike used its multimelta on the Skyray, immobilising it, then charged it and suffered and wound from the flechette dischargers. The bike squad failed to kill a Devilfish with their meltaguns, but charged it for good measure, shaking it so it couldn't shoot, but not after losing 2 of their number to its flechette dischargers. The Tau Broadsides on my left objective were mercilessly gunned down the the three Landspeeders and another Attack Bike which outflanked. On the far right, my Battlesuits jumped over the immobilising Skyray to deal some serious damage to the bike that had arrived. 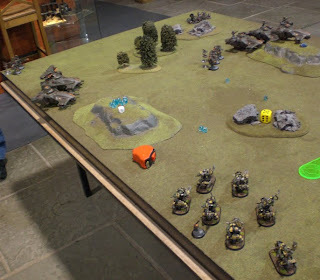 With nearly all the bikes wiped out, but 1 Attack Bike which was sitting on my objective, the Tau army mobilised for the abandoned Ravenwing objective. What then ensued was the gradual annihilation of both Land Speeders and Tau tanks, although the Tau smart missiles couldn't compare with the assault cannons of the Land Speeders. By Turn 5, only the Tau Battlesuit command team, an immobilised Skyray and 6 Firewarriors were left (to claim the Ravenwing objective). All the other vehicles were smoking wrecks. Thankfully that's when the game ended. Turn 6 I would have been fine, but if the game had continued until Turn 7, I would have been wiped out. Simon Thorne and his mate Jon arrived shortly after we had started our game, so James played a game against Jon's Eldar while Simon challenged me to face his Ork biker army once again. We rolled off and I won, giving Si the first turn. Si placed his counter on a hill in the centre of his deployment zone, while I placed mine to the right. He then set up his two units of Ork Biker Nobz with Painboyz and led by Warbosses on the right flank to claim his own objective and go for mine. So I deployed away from my own objective, just off centre towards the left hand corner. I set everything up to run and gun, sweeping around the flank, remaining out of charge range for as long as possible while baiting him in with units that might just be close enough for him to charge. The gambit worked as he drove both units into the centre, then zoomed one unit away to the far right objective after they had taken half their wounds and would begin to take leadership tests. So I threw a Hammerhead submunition round at him, inflicting another wound, causing him to take a Leadership test, which he failed. The Ork Nob with the boss pole smacked one of his mates to take the test again, but Si failed the roll again and they fled into the middle of the board, back into the range of my guns. The remaining members of the squad were gunned down in short order after the Painboy was killed, which removed the unit's Feel No Pain ability. The other Ork Biker mob had taken a few wounds during the game, so Simon used his 5th turn to zoom the Nob Bikers back to my objective while zooming a lone Ork Warboss to claim his own objective. The Tau army surged forward, getting 1 Devilfish into range to contest before firing every gun they had at him. Finally, it was up to the Broadside's railguns and they took him out, ending the game in a draw. It really goes to show how much better you can play if you know your opponent's army. Ironically, it didn't matter that I was a tactical genius, because the game still ended in a draw, but it's the best I could do in the situation. Even so, my victory had depended entirely on Simon having to set up first and take the first turn. After lunch, I played a game against a chap with an Imperial Guard army who had been admiring our armies earlier. I'd seen the load out on Valkyries before, but this would be the first time that I'd actually faced them. This guy also had Al'Raheim, which meant Outflanking. Valkyries Outflank too and he had an Astropath in his army to add +1 to his reserve rolls. Nice! He won the roll off with a 6 and made me go first. I could either set up everything up and get shot or reserve everything and arrived just after his units. Then I could make the most of my close range guns and counter his much stronger army. Turn 2, my Broadsides and a Devilfish arrived. His Turn 2, he rolled 3+ for every unit in his army. So much for my tactical planning. With hundreds of guns bearing down on me, there was nothing I could do and every unit that arrived was wiped out in short order. But I have to say that he was very lucky and consistently lucky. Everything seemed to hit, glance and immobilise. Or if it penetrated my tanks, they died straight away. I really didn't get a look in. Didn't even get a kill point. Nevermind. It was just 'one of those games'. But playing against this army would put me in good practice for another army which I would face on Sunday. So having played 3 games Luke arrived, so we promptly packed up and headed to our hotel before meeting up with some other friends at The Pit & Pendulum. 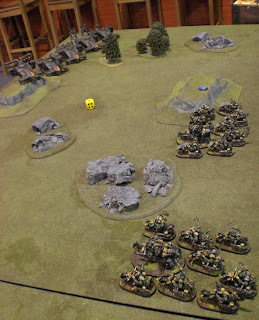 More battle reports from the Warhammer 40K Throne of Skulls Grand Tournament coming soon! My son has been running my Tau army and I am constantly reminding him to protect his assests. Flechette dischargers, shield drones, Stimulant Injectors, the whole nine yards. Keep your suits and armor alive and you will almost always be able to pull a draw. Nice writeup, looks like you guys are having fun! Those flechette dischargers are very effective -- especially against assault armies like daemons! Nice write ups & an enjoyable read.